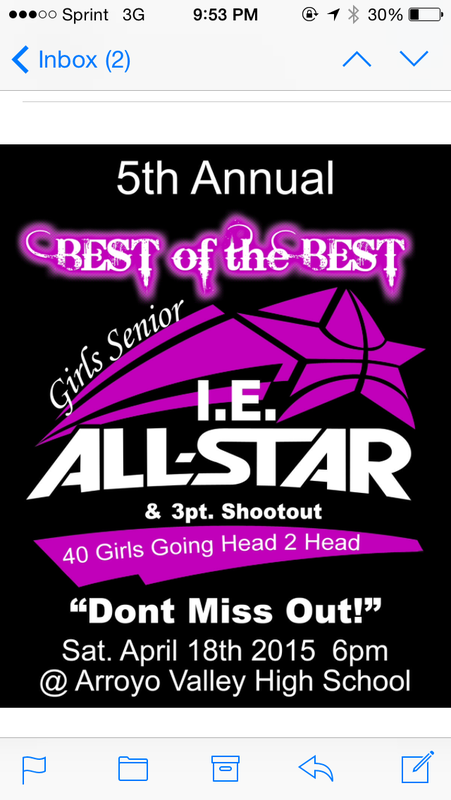 Above, is the flyer for Saturday’s all-star girls basketball game at Arroyo Valley Coach Michael Anderson will hold his second Best of the Best Girls All-Star Basketball Game on Saturday at 6 p.m. at Arroyo Valley. It’s a game he started when he was at Rialto. I hope not all of these players show up, because it will be difficult to get that many players playing time in the game. 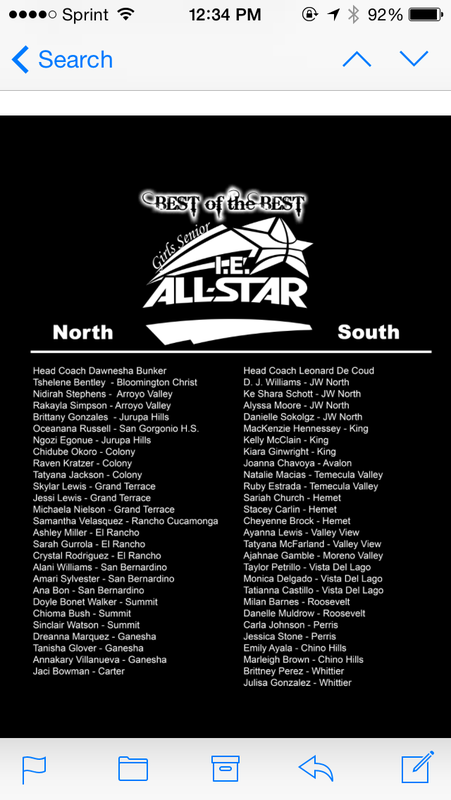 The North team will be coached by Bloomington Christian coach Dawnesha Buckner, and the preliminary roster included 20 players from San Bernardino County, including from Bloomington Christian, Arroyo Valley, Jurupa Hills, San Gorgonio, Colony, Grand Terrace, Rancho Cucamonga, San Bernardino, Summit and Carter. The team also has players from Ganesha and Pico Rivera El Rancho on the squad. The South team is largely from Riverside County, but also includes Chino Hills players. Is a 26-0 game in soccer excessive? What constitutes an excessive blowout that crosses the line for good sportsmanship? Earlier this season, the discussion was about Arroyo Valley girls basketball’s 161-2 win over Bloomington. While it doesn’t involve a local team, but what about Hemet Tahquitz’s 26-0 boys soccer victory over Los Angeles Summit View West? Which is worse? Well, the girls basketball game probably should never have been scheduled by the athletic directors, but the soccer was a Division 5 playoff game. The girls basketball score was 104-0 at halftime, and the leading scorer in the game, Tamera Trigg, scored 43 points compared to her season average of about 27. In the boys soccer game, it wasn’t reported what the score was at halftime. Marcos Rojo led the way for Tahquitz with seven goals. He had scored only 11 on the season before that. But the team had 14 different players score goals, and two others had assists. So are they both bad? And if so, which is worse? To be honest, I’d really need to see tape of both games. I’m sure something could’ve been done in both instances to hold the game down a little, but I don’t exactly know how excessive it was. I once reported about the aftermath of a game now nearly 20 years ago, a girls soccer game between Bonita and Ganesha. I believe the final score was 19-0 in favor of Bonita, in a league game. The problem was, the coach left his star player, Kendra Payne, in the game for too long and she set a CIF-SS record with 13 goals in the game (which I believe still stands). The consensus seemed to be that this was excessive, because they were scoring goals just so Payne could get the record. But 26-0 and 161-2? Whether excessive or not, it didn’t do the winning teams much good. Arroyo Valley girls basketball lost in the first round of the playoffs, while Tahquitz lost in the next round to Rialto. Did those teams get what they deserved? Some might say so, but I don’t think so, just that playing that kind of opponent isn’t really going to help in the long (or short) run. Arroyo Valley trailed (except for a couple of times the game was tied) for the entire game until Tamara Trigg’s layup gave them the lead for good midway through the fourht quarter. It wasn’t Arroyo Valley’s best performance, but it was a good test before the playoffs. 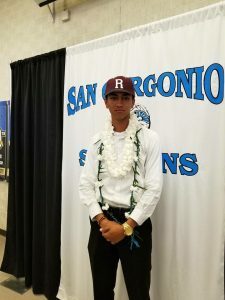 Michael Anderson talks about what it means to win league, especially after what the team’s first-ever league title means in the wake of bad publicity from a 159-point blowout last month. Arroyo Valley coach Michael Anderson admits he learned something from a 161-2 win, but he still kind of takes a shot at someone. Arroyo Valley girls basketball coach Michael Anderson admits score “got away from me” in 161-2 win, but stops short of apologizing. Should he apologize? VIDEO: Michael Anderson: would he do anything different? In the wake of the 161-2 win and his 2-game suspension, would coach Michael Anderson do anything different?